WHAT: Etsy-meets-foursquare app. Find and buy paintings, jewelry, furniture and other "unique" items in your area like unusual toys. View items by location or by what people in the community think is cool. Actual "marketplace" composed of independent coffee shops (50 in Chicago so far) that either display the work for sale or serve as a meeting point for buyers and sellers. Artists/sellers (for now) are reachable through comments portion of their item listings. Most popular items so far are vintage antiques and furniture. Goshi is experimenting with pop-up marketplaces where artists bring in items they've posted and the public can browse and buy. App is iPhone only, Android coming soon. Market-wise only in Chicago. Next up are New York and San Francisco. LAUNCHERS: Jack Eisenberg, a developer with a nonprofit background, and Chad Lomax, a long-time IT security specialist. WHY: People like to know about cool stuff in their area. Etsy has succeeded with its discovery-based selling of handmade goods. Cities already have independent coffee shops and retailers that can be used as physical and virtual marketplaces -- and these are generally safe places to meet. The local/mobile space is competitive but hot. WHEN/WHERE: iPhone app July 2011, founded 2010 / Chicago. 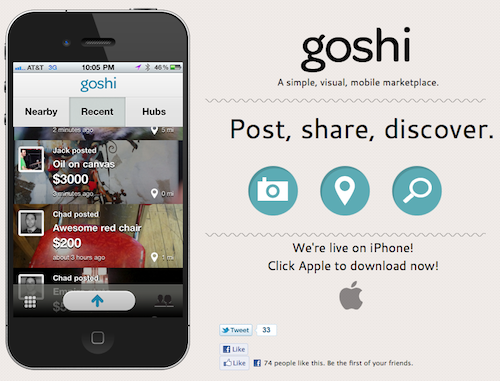 BACKSTORY: Goshi started as Mapding, a location-based version of craigslist for people to buy and sell anything. Jack began building it nine months before he entered Excelerate Labs, the first and only accelerator to which he applied. The questions Mapding kept getting once they entered the program: how do you get users and how do you get items? The company pivoted based on feedback from mentors and some "serious soul-searching," Jack says. "We started thinking, the creative community has a lot of items, why not talk to them?" he explains. BUSINESS MODEL: Percentage of all transactions although the percentage varies. Coffee shops volunteer to be part of Goshi and do not get a cut. Jack says they dig Goshi because it brings them more coffee customers and creates a good vibe. COMPETITION: Zaarly, Etsy -- especially if Etsy does a mobile app. "We're already planting a flag in the physical world, so this is defensible," says Jack. ON WORKING WITH INDEPENDENT COFFEE SHOPS: Although Jack wouldn't say he'd never partner with Starbucks or big-box retailers, he's not too keen on them either. Goshi is working with indies "because they tend to bring a lot more character and culture with them in terms of the kind of people who go there. Our bent is certainly local commerce." CUSTOMERS/GROWTH: Not disclosing number of app users, but Jack says that in addition to the 50 coffee shops they have partnerships with 15 galleries, 10 independent retailers and a "couple of major partnerships with people with unique items." GOAL: "Transform the way we experience local commerce," says Jack. "I would hope that in five years, in a post-Goshi world, somebody who wants to discover something cool would pull out their phone and see what's on Goshi." WHO BACKED IT: Excelerate Labs. Previously bootstrapped. NUMBER OF EMPLOYEES: 2 with part-time contributors on backend, UX and marketing. See what's nearby or what's recent by choosing a tab at the top. Both present photos of items with the item's name, its price, when it was posted, who posted it, and the item's distance from your location. Tap on a listing to read comments, add a comment and share it. When adding an item, say what it is, list the price and add a description. You can also include a photo. So that other people in your area can find it, hit "post this to a hub."